I have been procrastinating on my monthly portfolio updates. Here is the supposed update for the end of February, but since it's the end of March now I will just summarize what is happening with my portfolio up until now, March 31 2018. The S&P500 has been rough lately. It is no longer as sanguine as it used to be. Trade war terrors, Trump tweet targeting specific industries or companies, information security crisis at extremely large companies, and instability with the current administration has caused unease with the markets. However, I still feel very positive about the market because of the tax reductions to corporations and the general growth the economy is experiencing right now. I am a big believer in American business and have always felt the place to invest is always in the USA. The dollar is also weakening considerably. This is a major tailwind for a large chunk of my portfolio as I hold many companies who operate internationally. A weak dollar will boost handsomely the money held overseas when converted into US Dollars. Crude oil has been rising. I do not hold many companies directly affected by the price of oil. Rising oil costs will increase material costs for the companies I hold but I don't see it affecting them significantly. If anything, the low oil prices in the past has caused the overall market to tank because it was thought to be seen as a sign of low demand or low economic activity. Higher oil prices, although bad for most businesses, may be seen now as a boom because economic activity is high causing higher demand for oil. Anyways, rising oil prices will definitely help those downtrodden oil businesses. I find oil to be a "dying" business with a bad reputation. Oil is not the way of the future (many decades from now) and I want to invest in businesses that will continue being pretty much the same many decades from now (i.e. toilet paper will still be toilet paper and toothpaste will still be toothpaste 100 years from now). My portfolio has been choppy in the last few weeks. It has peaked close to $450K when the market went parabolic. It has went as low as $420K but it now sits at $433K. My contributions every 2 weeks are helping somewhat even out the volatility. 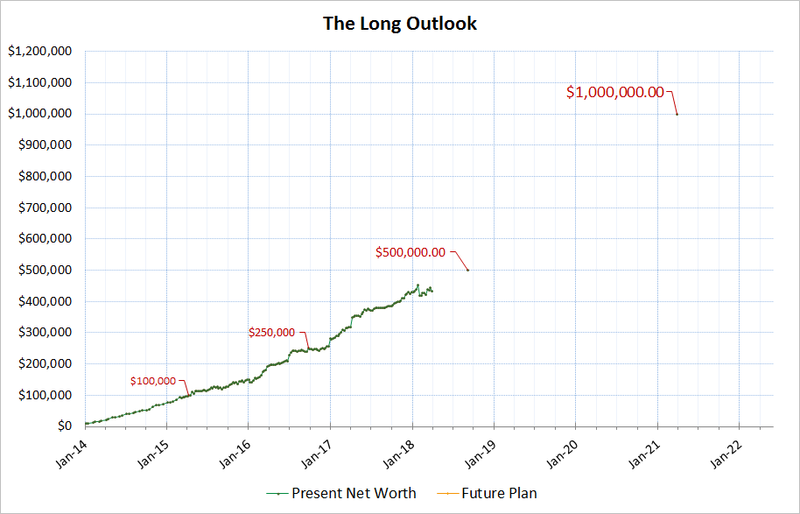 My contributions now however are not so large in comparison to the overall portfolio value. I am holding significant amount of cash right now. I have around $24K in cash. Tax season is coming up in April and I am holding buffer supply of cash in case I need to do any transactions to the IRS. After April I will most likely deploy the bulk of this cash and get a nice big boost in my forward dividends. The market is in a cheap place now and I am looking forward to adding to more stock as the yield %s are much better right now than in January. I have not added anything into my portfolio for many weeks, or if I did add anything it is usually too small to matter. Portfolio activity has slowed down significantly since the start of the new year. I guess this has panned out well for me as the market was very expensive earlier this year and prices have pulled back, many to correction level territories. My largest sector is in consumer staples. I plan to keep it that way. In the recent pull backs, I am going to take advantage of the lower prices and add to Industrials and Healthcare. I am also researching now some Technology companies that pay dividends that I could add. MSFT for example is something attractive to me and it's one of the cleanest balance sheets in the world, to me it's high quality and that dividend is very safe. The graphs below show my portfolio value over time and also the forward annual dividends I will receive. Although the portfolio value graph is choppy, the growth upwards is still happening which is great. This is likely due to my biweekly contribution of cash into my investing account. 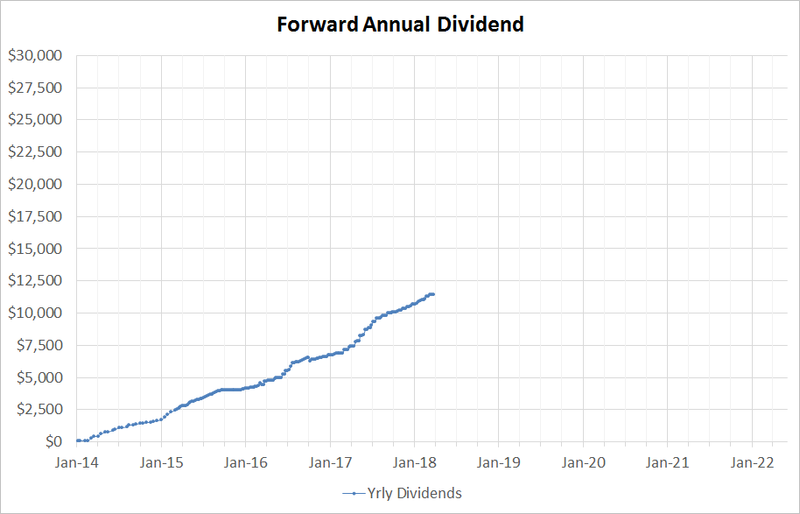 In terms of dividends, the bottom graph shows that the trend is a very smooth direction upward. This is because of all the dividend increases each of my companies do every year, the dollars that get reinvested back into the stocks that paid the dividend, and my contributions every now and then into more shares. I also notice that the dividend increases this year are on the high side. I think this is largely due to the Trump corporate tax reduction changes and repatriation which is a great boost to business and shareholder return. In the next coming weeks, I think volatility will still be there. Volatility allows prices to drop and rise. When prices drop, it is always handy to have a list of high quality companies one wants to buy. For example, in the Industrial sector I am eyeing heavily MMM, ITW, GD, and I also started watching Boeing (BA) which I do not own. In the healthcare space I am looking at JNJ and BDX. And in Technology I am always looking at adding new names as I do not have any. MSFT and ACN are companies I am considering. I usually do not consider the hyped names like Amazon Facebook Netflix Google because they do not pay me dividends. I don't plan to exercise any purchases until after the middle of April. After tax season is over I will publish my thoughts on what I want to buy. Great summary and very nice picks of stocks in your portfolio. I noticed you mentioned waiting for tax season to end before investing more funds, I'm wondering why you need to wait? You can file and pay your taxes as early as February, that's when I payed mine. You don't have to wait for April to file taxes. This year I predicted I will owe taxes so I am waiting until the due date to pay the IRS. In the past I filed usually in February. Great progress, YD. The charts tell the story. 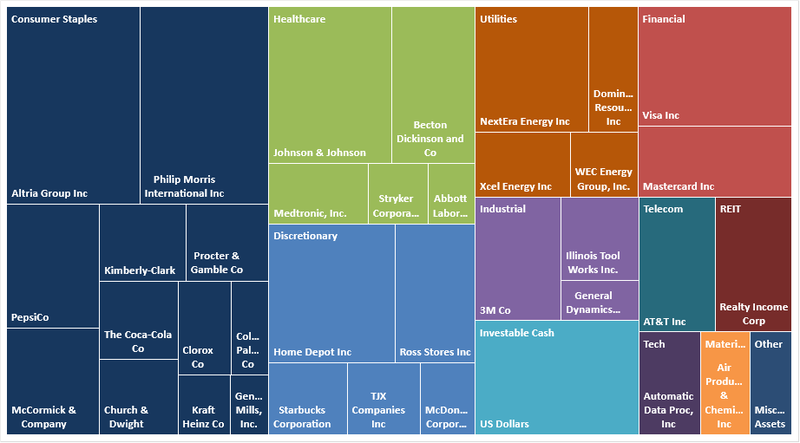 I was wondering why your Tech allocation was so small given that it's nearly 25% of the S&P 500. However, it sounds like you'll be adding there, perhaps with MSFT. Keep on grinding young one, opportunities are coming, be ready to keep adding to that forward income! We all happy to known much about this portfolio to make monthly resources. That all we have chosen to prepare essayshark reviews. Then you will manage everything to update the valuable features.